I can’t say enough about the Tuberose. I love this fragrance and Tara has shared one here that she likes. Aerin Lauder’s version of Tuberose is also a more main stream version of this flower. I always receive compliments when I wear it in spite of its more commercial status. Tubereuse 1 is capricieuse by name and capricious by nature. It’s wonderfully unexpected. Created by Gérald Ghislain and released in 2009, Tubereuse 1 Capricieuse is part of the Tuberose Trilogy collection. First off, despite what you see on the note list it’s not a tuberose heavy fragrance at all. It’s essentially a beguiling iris suede with saffron and hints of tuberose. It’s not nearly as straight forward as that though. 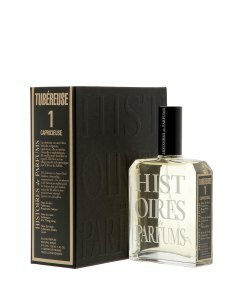 Tubereuse 1 is striking from the initial spray. The effect to start with is that of slightly sweet dust on leather. The iris is powdery and grey, sprinkled with saffron and set against thick pile suede or a dusty antique leather-bound book.